Cost effective and super easy to use, this Masterbuilt Electric Smoker is great for both beginners and experienced meat smokers alike. If you are in the market for a low-cost quality meat smoker with the convenience of the set and forget then this product might be for you. Masterbuilt Smokehouse features including a fully insulated powder-coated body with 4 racks for all your favorite meats. An innovative side loader for your wood chips allows you to maintain constant temperature but still ad wood as needed. Where this model shines though is the digital control unit. All you do is set your temperature and time and you are done! And one of the main advantages of electric over charcoal or propane is that it is easy to maintain your temperature with the digital control. The removable water pan allows you to add vinegar or juice or any liquid to add moisture and flavor to your food. Plus the wood tray design allows for the use of chips or pellets. While this wouldn’t be our top recommendation for competitive pro-smokers, this model has a lot to offer for an excellent price. For beginners, it’s pretty much foolproof. Some consumers have had issues with the heating element eventually not working and not being able to get it replaced. It is our understanding that the newer models have had this problem fixed. Holds heat very well, even in colder climates due to the 100% insulation. Much cleaner and easier to use than a charcoal smoker. Side loading door allows for adding chips or pellets during smoking without losing heat or smoke from opening the main door. Digital control allows for the set and forgets meat smoking. Short 6-foot cord means you have to set it up close to an available outlet. Masterbuilt does not recommend using an extension cord. A lot of complaints about the element not working overtime and wiring issues have also been reported. No cooking or recipe instructions come with the unit although it is quite easy to find this information online. This model doesn’t come with a cover, although Amazon sells one for $. Not suitable for cold smoking as the element used for the wood chips generate too much heat. However, Masterbuilt does make a cold smoking adapter kit that fits on all of their electric side loading smokers. Click here to check it out. Buy a remote thermometer, so you don’t have to open the door to tell what temperature your meat is at. Use aluminum foil to wrap your water pan and drip tray to make clean up even easier. The cheapest place we have consistently seen this model offered is Amazon although you can occasionally find it on sale at some of the big box stores or outdoor stores for even cheaper. Amazon also offers free shipping which is hard to beat. This electric smoker also has a 4 out of 5-star rating with over 513 customer reviews over at Amazon. 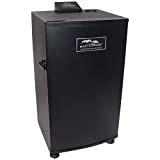 If you need a quality electric smoker that gets the job done without a lot of fancy bells and whistles, then we highly recommend you check out the Masterbuilt 20070910 30-Inch Electric Smokehouse Smoker. If you would like all the same features with a couple of small upgrades like viewing window and remote control, then check out our review over here of the upgraded version of the Masterbuilt 30-Inch Electric Smoker.